Andreas Seppi of Italy, right, is congratulated by Roger Federer of Switzerland after Seppi won their third-round match Friday at the Australian Open in Melbourne. Roger Federer is still one of the world’s best tennis players. He’s just more likely than he used to be to lose to guys who aren’t. Federer fell Friday at the Australian Open to Andreas Seppi, the world No. 46 who had lost his past 23 matches against top 10 players and all 10 of his previous matches against Federer. While it was highly surprising that Seppi beat Federer, who is ranked second in the world, it’s become a lot less surprising to see Federer lose at some stage to a much lower-ranked player at a Grand Slam tournament. In 2013, he lost to No. 116 Sergiy Stakhovsky at Wimbledon and, at the U.S. Open, to No. 22 Tommy Robredo — who’d been winless against Federer in 10 prior meetings. Last year, Federer lost twice at Slams to men ranked outside the top 15. This is a big change from Federer’s prime, when only the best players beat him at the biggest events — if anyone did. In a five-year stretch starting at Wimbledon in 2004, no one outside the top five beat him at a Grand Slam. Stakhovsky’s upset in 2013 ended a nine-year stretch in which Federer was undefeated at Slams against players outside the top 20. A drop in consistency for the most consistently great men’s player of all time still leaves Federer in pretty good company, even at age 33. Pete Sampras, whose record for Grand Slam titles Federer broke, had five losses at Slams to players outside the top 20 during his prime. Rafael Nadal, who is five years younger than Federer, has three losses to players ranked No. 100 or lower in his past seven Slams. 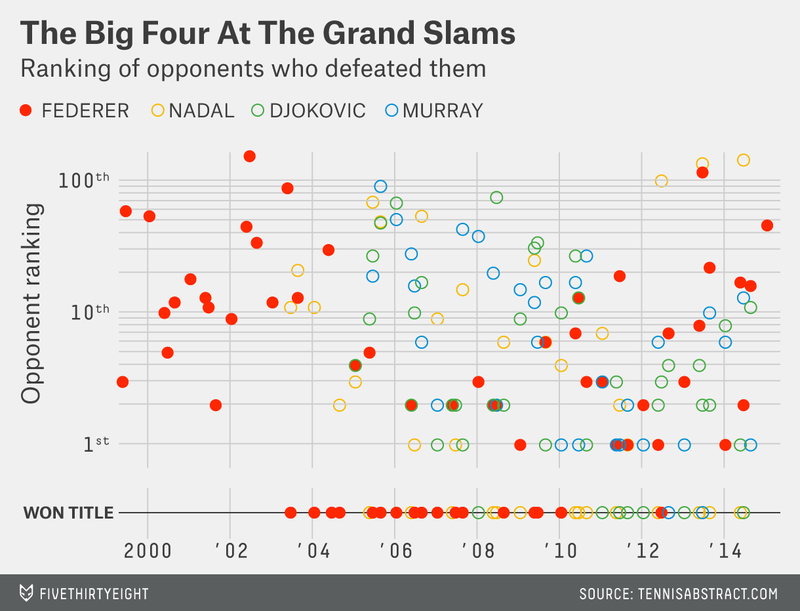 Novak Djokovic and Andy Murray, who together with Federer and Nadal make up the Big Four of men’s tennis, have avoided bad Slam losses since 2010. The two 27-year-olds will need to keep avoiding major upsets for a few more years to match Federer’s run of consistency.